Objective To increase clinician adherence to prescribing guidelines for pulmonary medications in children with cystic fibrosis (CF). Design Quality improvement project with multiple time series design. Setting The CF center at a tertiary care pediatric hospital in the United States. Patients Children with CF who were eligible to receive oral azithromycin, nebulized dornase alfa, or inhaled tobramycin sulfate based on prescribing guidelines for CF lung disease. Intervention Evidence-based prescribing guidelines were designed by a local committee to reflect consensus recommendations from the CF Foundation. Clinicians and families were educated about guidelines. Adherence to prescribing guidelines was tracked using a local CF database and record reviews. Weekly meetings were used to highlight adherence failures and promote clinician accountability. Main Outcome Measure The rate of clinician adherence to prescribing guidelines. Results One hundred seventy patients with CF were included. At the start of the project, the rate of clinician adherence to prescribing guidelines was 62%. After 3 months of the project, the rate of clinician adherence to prescribing guidelines was 87% (odds ratio = 4.6; 95% confidence interval, 3.0-7.0). The improvements in adherence to prescribing guidelines were sustained for 21 months of follow-up. Conclusions Educating clinicians about prescribing guidelines, sharing guidelines with families, and monitoring clinician adherence improve prescribing adherence to evidence-based recommendations. Lung function is a predictor of mortality and survival in cystic fibrosis (CF).1-4 Infection and inflammation in CF result in the progressive loss of lung function and early death from respiratory failure. Advances in pulmonary care in CF in the past 2 decades include oral anti-inflammatory therapies (azithromycin, ibuprofen), inhaled mucolytics (dornase alfa, hypertonic saline), and inhaled antibiotics (tobramycin sulfate).5-10 These therapies are supported by level I evidence from randomized controlled trials.5-10 A major barrier to improving pulmonary outcomes in CF, however, is poor clinician adherence to prescribing guidelines. According to CF center self-report, adherence to prescribing guidelines for oral azithromycin, inhaled tobramycin, and nebulized dornase alfa is low (66%, 67%, and 76%, respectively).11 Adherence to prescribing guidelines for oral ibuprofen and nebulized hypertonic saline is lower (4% and 40%, respectively).11 The inference is that many patients with CF receive suboptimal pulmonary care owing to the failure to prescribe medications according to evidence-based recommendations. Poor clinician adherence to prescribing guidelines is a common barrier in health care delivery. A study of patients with acute myocardial infarction in US emergency departments from 1998 to 2004 revealed that 40% of patients received aspirin and 18% received β-blocker medications according to prescribing guidelines.12 The investigators concluded that 22 000 excess patient deaths occurred owing to poor prescribing adherence by clinicians.12 Adherence to guidelines is poor in other disciplines as well. Guideline adherence for surgical interventions in valvular heart disease in the United States and Europe is estimated at 60% to 62%.13,14 Why is there such a large disparity between evidence-based guidelines and clinical practice across disciplines and across the globe? Cabana et al15 concluded that common barriers to guideline adherence include a lack of awareness of guidelines, a lack of familiarity with guidelines, and difficulty in overcoming the inertia of previous practice patterns. In this study, we describe a generally applicable model to improve adherence to prescribing guidelines. Our project addresses 2 questions. First, do improving clinician awareness of and familiarity with prescribing guidelines and monitoring prescribing adherence change prescribing patterns? Second, does including families in the improvement process help overcome the inertia of previous practice patterns? Cincinnati Children's Hospital Medical Center (CCHMC), Cincinnati, Ohio, is a 490-bed tertiary care pediatric center in the United States with a strong commitment to quality improvement. The hospital has a Division of Health Policy and Clinical Effectiveness that directs the hospital's quality improvement efforts. The CF center at CCHMC has 210 patients aged 0 to 21 years. Patients in our center make routine clinical visits every 3 months. A local CF database is maintained with all lung function, nutritional, demographic, and medication information for each patient. The data from our CF database are included in the National CF Registry. The CF center is staffed by 5 CF physician and nurse pair teams and 2 advanced practice nurses. The term clinician in this article refers to the 5 CF physicians and 1 advanced practice nurse who provided outpatient care to our patients during the study period. The CF quality improvement steering committee at CCHMC initiated this project. The steering committee chose the medications involved (oral azithromycin, nebulized dornase alfa, and inhaled tobramycin). A special project group that included a parent advocate was formed. Data for this project were gathered by the local CF data team. Eligibility for medications was reassessed frequently by screening our local CF database for patient age, weight, and infection status for Pseudomonas aeruginosa. Information on prescribing adherence was obtained from record reviews and confirmed by CF physician and nurse teams. The parent advocate designed the approach for how to involve families in the project. Families were notified of the project via direct mail. Family handouts were developed by the project group to describe the risks, benefits, and eligibility criteria for each medication. Handouts were reviewed, edited, and approved by the parent advocate. Handouts were saved on the clinic computers and were given to families by clinic nurses on arrival at the clinic if their children were eligible for but not yet prescribed medications according to prescribing guidelines (adherence failures). A review of the literature was conducted using the PubMed database to identify randomized trials that involved the use of oral azithromycin, nebulized dornase alfa, and inhaled tobramycin in CF. An evidence-based consensus was reached by the project committee for when to prescribe each pulmonary medication. The prescribing guidelines were consistent with guidelines published in 2007 by the CF Foundation.16 Oral azithromycin was recommended for patients aged 6 years and older with chronic P aeruginosa infection (defined as 2 positive cultures in the past 12 months) and a weight of 25 kg or more. Nebulized dornase alfa was recommended for patients aged 6 years and older. Inhaled tobramycin was recommended for patients aged 6 years and older with chronic Pseudomonas infection. The project team used the plan-do-study-act framework for quality improvement research.17 Plan-do-study-act quality improvement research is designed to establish relationships between process changes in health care systems and changes in outcomes, while accounting for normal variation.17 A multiple time series design is used to establish the relationships between systems-level changes and changes in outcomes over time.17 The plan-do-study-act cycles in this project were initially small. We met with each clinician and nurse CF team to educate them about prescribing guidelines and shared their prescribing adherence rate. We informed families about the project and educated them about prescribing guidelines in the clinic. The study of these interventions was qualitative. Clinician and nurse teams were interested in improving prescribing adherence and wanted feedback about their prescribing adherence rates. Families were interested in learning about prescribing guidelines and improving prescribing adherence in our CF center. With these positive qualitative responses, we implemented these interventions on an ongoing basis. Health care providers were given data about prescribing adherence, and families were routinely approached in the clinic. The quantitative data analysis for this project was performed every 3 months. After the first 3 months of the project, we had identified and mitigated almost all prescribing adherence failures. To make our interventions sustainable after the project's completion, we used the weekly CF patient record conference that is a feature of all CF centers. We made identifying and mitigating all prescribing adherence failures a new feature of the weekly patient conference. The study population was all patients with CF in our CF center who met criteria for starting treatment with oral azithromycin, nebulized dornase alfa, or inhaled tobramycin. The primary outcome was the rate of adherence to prescribing guidelines for these medications. The quarterly rate of adherence was defined as the number of patients prescribed medications according to prescribing guidelines divided by the number of patients eligible. Quarterly adherence rates were assigned to 1 of 3 categories: baseline before the start of the project, during the 3-month implementation phase, or during the 21-month project follow-up phase. Secondary outcome measures included the rate at which patients were prescribed all of their guideline-recommended medications, the rate at which patients were offered new medications, and the rate at which patients declined new medications for which they were eligible. A multiple time series analysis was performed to determine whether the rate of adherence to prescription guidelines for oral azithromycin, nebulized dornase alfa, or inhaled tobramycin increased during the project. Run charts were created for each medication to document quarterly adherence to evidence-based prescribing guidelines. These were basic statistical process charts that graphed the quality improvement measures on the y-axis over time on the x-axis. To compare preintervention and postintervention levels of adherence to prescribing guidelines, a generalized linear mixed model with a logit link was fit. Comparisons are reported as odds ratios (ORs) with 95% confidence intervals (CIs). All statistical analyses were performed using SAS version 9.1.3 statistical software (SAS Institute Inc, Cary, North Carolina). A significance level of α < .05 was used for all tests. At the start of the project, 134 patients were eligible for 203 unique medication prescriptions according to prescribing guidelines (some patients were eligible for >1 medication). Clinicians, however, had prescribed only 125 of these 203 medications. The starting rate of prescribing adherence was 62% (Figure 1, quarter 0). The prescribing adherence rate was consistent in each of the 4 yearly quarters before the start of the project (Figure 1, quarter −3 to quarter 0). After the first 3 months of the project (Figure 1, quarter 1), the prescribing adherence rate increased to 87% (OR = 4.6; 95% CI, 3.0-7.0). The prescribing adherence rates at the start of the project were 47% for oral azithromycin, 71% for nebulized dornase alfa, and 42% for inhaled tobramycin (Figure 2, quarter 0; Figure 3). The prescribing adherence rates after the first 3 months of the project were 84% for oral azithromycin (OR = 6.1; 95% CI, 2.5-14.8), 91% for nebulized dornase alfa (OR = 4.2; 95% CI, 2.4-7.1), and 74% for inhaled tobramycin (OR = 3.8; 95% CI, 1.9-7.7) (Figure 2, quarter 1; Figure 3). The improvements in adherence to prescribing guidelines were sustained for 21 months of project follow-up (Figure 1 and Figure 2). Run chart of clinician adherence to prescribing guidelines for oral azithromycin, nebulized dornase alfa, and inhaled tobramycin sulfate. Baseline data are shown from quarter −3 to quarter 0 (start of the project). Results are shown after the first 3 months of the project (quarter 1) and for 21 months of follow-up (quarters 2-8). Run chart of clinician adherence to prescribing guidelines by medication for oral azithromycin, nebulized dornase alfa, and inhaled tobramycin sulfate. Baseline data are shown from quarter −3 to quarter 0 (start of the project). Results are shown after the first 3 months of the project (quarter 1) and for 21 months of follow-up (quarters 2-8). Bar chart demonstrating changes in clinician adherence to prescribing guidelines in our cystic fibrosis center for oral azithromycin, nebulized dornase alfa, and inhaled tobramycin during the first 3 months of the project. At the start of the project, only 42% of patients were prescribed all of their recommended therapies. After the first 3 months of the project, 87% (OR = 4.8; 95% CI, 3.1-7.5) of patients with CF were prescribed all of their recommended therapies. During the first 3 months of the project, 95% of the patients who were not prescribed all guideline-recommended therapies were offered these therapies. Eighty-two percent of these families agreed to start new therapies, while the other 18% of families declined. This study provides a framework for improving adherence to prescribing guidelines in an outpatient setting. Clinicians were educated about prescribing guidelines and the supporting evidence. The prescribing guidelines and project goals were shared with families. Weekly patient care meetings were used to address prescribing adherence failures. We believe the involvement of families in this project, including having a parent advocate on the project team, was an important step in overcoming the inertia of previous practice patterns. Our goal was to shift the clinician-family relationship from one in which the clinician made treatment recommendations to the family and was solely responsible for prescribing guidelines to one in which the family advocated for guideline-recommended therapies from their CF clinician. By doing this, we hoped to remove clinicians as the major barriers to prescribing adherence. It is not surprising that when offered new guideline-recommended therapies, families overwhelmingly chose to initiate these therapies. The low baseline adherence rate to prescribing guidelines in our study was not the result of family preference. Evidence-based therapies were not being reliably offered by clinicians when patients became eligible for them according to guideline-based criteria. Our prior reliance on clinicians to adhere to prescribing guidelines at a high rate, without educating them and without tracking prescribing adherence, resulted in suboptimal health care delivery. Empowering families to promote prescribing adherence by sharing guidelines with them is an intervention we used that could be effective in most chronic care settings with an engaged patient base. This study was limited by its single-center design and was not a randomized clinical trial. The CCHMC is a center with expertise in quality improvement work. The institutional environment and the quality improvement spirit at CCHMC may have contributed significantly to this project's success. This study was limited by its focus on CF. The CF Foundation of North America focuses on clinical research and outcomes improvement. Our patients frequently participate in research to help improve clinical outcomes. For these reasons, our results may not be reflective of results from other medical centers or other clinical settings. 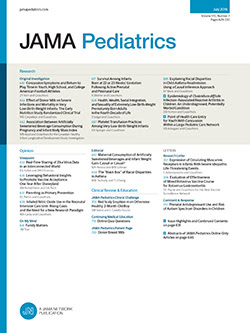 Educating clinicians about evidence-based prescribing guidelines, sharing guidelines with families, and tracking prescribing adherence improve health care delivery. These interventions can be generalized to most patient care settings. Correspondence: Gary L. McPhail, MD, Division of Pulmonary Medicine, Cincinnati Children's Hospital Medical Center, ML 2021, 3333 Burnet Ave, Cincinnati, OH 45229-3039 (gary.mcphail@cchmc.org). Accepted for Publication: March 30, 2010. Author Contributions: Dr McPhail had full access to all of the data in the study and takes responsibility for the integrity of the data and the accuracy of the data analysis. Study concept and design: McPhail, Weiland, Acton, Ednick, Amin, and Seid. Acquisition of data: McPhail and Weiland. Analysis and interpretation of data: McPhail, Weiland, Chima, VanDyke, and Fenchel. Drafting of the manuscript: McPhail, Weiland, and Chima. Critical revision of the manuscript for important intellectual content: Weiland, Acton, Ednick, VanDyke, Fenchel, Amin, and Seid. Statistical analysis: VanDyke and Fenchel. Administrative, technical, and material support: Weiland, Ednick, and Chima. Study supervision: McPhail, Weiland, Acton, Amin, and Seid. Funding/Support: This study was supported by the Division of Pulmonary Medicine, Cincinnati Children's Hospital Medical Center. Role of the Sponsor: The Division of Pulmonary Medicine, Cincinnati Children's Hospital Medical Center had no role in the design and conduct of the study; in the collection, analysis, and interpretation of the data; or in the preparation, review, or approval of the manuscript. Additional Contributions: We are indebted to James M. Anderson, JD, Uma R. Kotagal, MBBS, MSc, and Thomas F. Boat, MD, for their long-term dedication to quality improvement and the CF center at Cincinnati Children's Hospital Medical Center.